The miracle of weight training is that it slows muscle tissue loss associated with aging. In fact, it is even possible to regain muscle that has been lost. Cardiovascular training and stretching have their place in a balanced fitness plan. But it is progressive resistance exercise that builds muscle, allowing us to stay young, active, and independent for as long as possible. Nothing else comes close to being as effective. Inactive men and women over age 30 slowly lose muscle tissue every year. At about age 50 this loss of muscle (and strength and endurance) starts happening faster. And after age 65, it accelerates even more. Scientists have a name for it. They call it "sarcopenia.” It is from the Greek, meaning “poverty of flesh.” It is what we see in frail, elderly people who are bent over from a combination of osteoporosis and sarcopenia, the wasting away of muscle tissue. Age will take its toll, of course. But a poor diet and sedentary lifestyle will greatly accelerate the decline. While exercising with weights applies the brakes. In fact, with proper nutrition and this kind of training, muscle can not only be retained, some that has been lost can be rebuilt. It is the safest natural prescription there is for anti-aging. 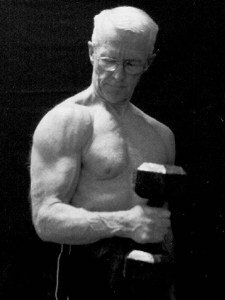 Put another way, barbells and dumbbells are the antidote to sarcopenia. Weight training is popular today with people of all ages, but it is not new. Progressive resistance exercise began in southern Italy in about 500 B.C. A man named Milo decided to shoulder a small calf and carry it the length of the stadium at Olympia. The story goes that he continued carrying it regularly until it was full grown. As the animal got heavier, Milo got progressively stronger. Understanding the story of Milo is to understand the foundation of all progressive resistance training programs. You begin by lifting something that is very manageable and gradually add to it over time. While lifting barbells and dumbbells is the most common form of this kind of weight training, bodyweight exercises, Pilates, resistance bands, kettlebells, sandbags, and various fitness machines and devices can also be used to provide progressive resistance. Even water aerobics, though classified as cardiovascular, is really a form of resistance training. Senior beginners should first have a physical examination and discuss with their doctor their plan for a fitness weight training program. If some activities or exercises should for any reason be restricted, you want to know about it before beginning a program. Next, you should arrange to get proper instruction. Follow a beginner's program or schedule a few sessions with a personal trainer to get off to a good, safe start. Doing too much too soon or using improper lifting techniques can lead to setbacks, or something more serious. Resistance exercise is great! But be smart and do age appropriate training. Other resources . . .
Richard Winett, Ph.D., offers training advice for senior athletes.